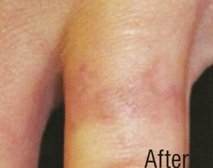 We perform tattoo removal with laser treatment using Tri-lase Q-switched and Erbium Laser for permanent removal of tattoos and treatment of pigmented lesions in our facility in Portsmouth, NH. Call us to schedule a consultation or an appointment for treatment. The epidermis, the outermost layer of your skin, is responsible for the look and health of the skin. It protects the body and renews itself by shedding dead skin cells and replacing them with healthy new ones. This process slows down as we age causing discolorations, roughness and dryness. The dermis, the inner layer of the skin, is made up of connective tissue containing college and elast in fibers that provide a support structure for the skin. Again, as we age, the amount of collagen and elast in in the skin is reduced causing the skin to become loose and thinner. Most tattoos are made with an electrically powered tattoo machine. The machines have either a single needle or many needles that can puncture the skin between 80 and 150 times per second. The needles deposit tiny dots of insoluble ink into the dermal-epidermal junction of the skin. These dots of dispersed pigment flow together to make the image. the FDA does not regulate the ingredients of the pigmented dyes used by tattoo artists. Synthetic pigments and colorants can vary widely from industrial organics to mineral s to plastic -based compounds. Tri-Lase uses an arsenal of light-based wavelengths that are attracted to tattoo ink. 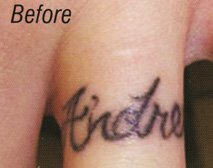 To clear the ink from the skin, the laser system creates a collimated energy beam of light which passes through the outer layers of skin targeting only the ink in the layers below . Energy from the laser is absorbed by the ink which causes the pigment to fracture into tiny particles. The body’s immune system eliminates the particles from the skin causing the tattoo to fade and over several weeks disappear altogether. The Tri-Lase system is a safe adn effective method of treatment for Tattoo removal. You can expect reliable and predictable clinical results with very minimal risk of adverse reactions or textural changes to the skin. Tri-Lase selectively shatters and destroys the targeted tattoo while preserving the surrounding healthy cellular structures. The skin’s immune systems begins to start cleansing the ink fragments from the body. What types of tattoos can be removed from the skin? 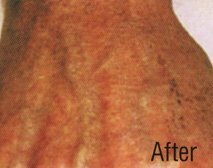 The tri-lase laser sytem is specifically engineered to to remove a wide variety of tattoos from professional to home made to amateur, multiple inks, as well as traumatic and surgical tattoos. A consultation will help determine if your tattoo can be successfully removed and in how many sessions. How long you have had your tattoo. 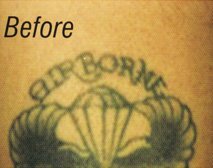 Older tattoos are actually easier to remove. Whether it was created by an amateur or a professional. Professional tattoos usually require three to nine treatments, spaced about four to six weeks apart, allowing your immune system to naturally eliminate the fragments. Patients report that it feels similar to getting a tattoo. Others report that it feels like a rubber band snapping. At the Skin Wellness Center at Atlantic Plastic Surgery, we provide a numbing cream that can be applied 30 to 60 minutes ahead of time, which helps make the treatment more comfortable. The patient is asked to wear eye protection consisting of an opaque covering or goggles. 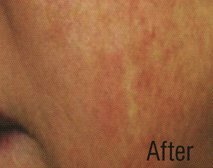 The skin’s reaction to the laser is tested during the first visit to determine the most effective treatment. Treatment consists of placing a handpiece against the surface of the skin and activating the laser. As many patients describe it, each pulse feels like the snapping of a rubber band against the skin. Smaller tattoos or lesions require fewer pulses, while larger ones will require more. All tattoos will require re-treatments, necessitating multiple patient visits. Depending on the size and the colors of the area to be treated, it will take anywhere from 6 to 12 treatments in most cases. For more extensive tattoos, it may take more treatments. Expect to come in every 6-8 weeks for your treatments. Immediately following treatment, an ice pack may be applied to soothe the treated area. A topical antibiotic cream or ointment is recommended. Care should be taken in the first few days following treatment to avoid scrubbing the area. Abrasive skin cleansers should be avoided. A bandage or patch may help to prevent abrasion of the treated area. During the course of treatment, it is recommended that patients cover the area with a sun block that is approved by the treating physician. Patients will experience temporary discoloration or reddening of the skin around the treatment area. 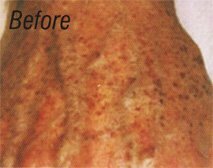 Some patients may also experience a temporary lightening or darkening of the skin for a few months following treatment. 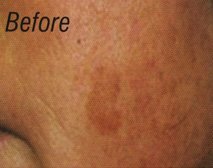 The skin will typically go back to your normal pigmentation color. It is important to follow the recommendations of your doctor. Call our office at (603) 431-8819 to schedule a consultation. 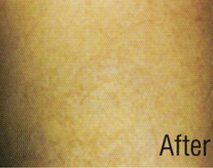 Tattoo removal costs $200 per business card size area per treatment. Package pricing is available.